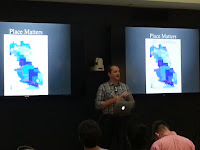 On Tuesday night I attended the weekly Chicago Hack Night event, and learned of a new web resource called ChicagosMillionDollarBlocks, The site focuses on the high costs of incarceration, and looks at this on a block-by-block level. The maps communicate a message that is also shown on other maps I've pointed to on this web site. If you're in a poor neighborhood, you suffer more than if you're in a more affluent neighborhood. I encourage you to browse the map and become familiar with the information. In my Twitter feed today I saw another map-based resource. The US Department of Education has created a set of maps to help people understand public school discipline and suspension and how this differs in different places, and for different students. I'd like to see each site that host interactive data maps host a presentation like the one below, showing people how to zoom into the maps, to create jpgs that can be used in 'map-stories' that build greater understanding, increase the number of people interested in the topic, and increase the number of people spending personal time, talent and dollars trying to create change. If you're interested in the topic featured on these maps, or in any of the other articles I've posted on this blog, send out a message on social media encouraging people you know to take a look at the articles and the web sites. Do this once a week and you're already taking an active role in making change happen. For the past few years I've been using this blog to highlight mapping platforms hosted by others, in addition to showing how GIS maps and concept maps can be used to communicate ideas and mobilize resources. Today I read an article in the Chronicle of Philanthropy that used two different data sources to create a map showing different levels of philanthropic giving in every county in the USA. One set of data came from a How America Gives map, created by The Chronicle. The second map, was created by the Opportunity Index. 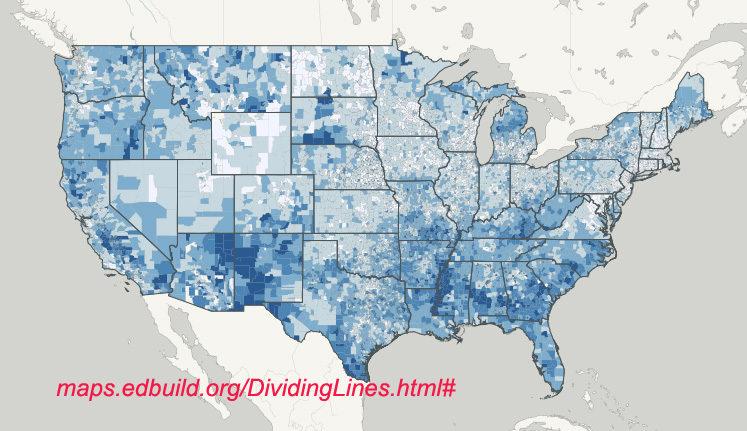 By combining data from both maps, a more comprehensive picture of giving was created. Visit the site and read the full story. Share with your friends on social media so more people take a look at this. As you look at these maps, look for ways to recruit teams of students, volunteers and professionals who will create map stories that focus attention on specific neighborhoods of where the need for philanthropic support is greatest. 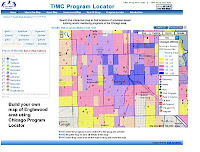 In the Tutor/Mentor Connection Map Gallery, we've posted some map-stories created in past years, as examples of the type of stories that need to be written over, and over, by many different people, but for the common purpose of generating more consistent, on-going and flexible support for volunteer-based tutoring, mentoring and learning programs operating in different neighborhoods of Chicago and other cities around the country (world). I hope to see stories from anti-poverty and inequality activists using these maps to draw support to new strategies that improve the learning paths for kids in these areas. 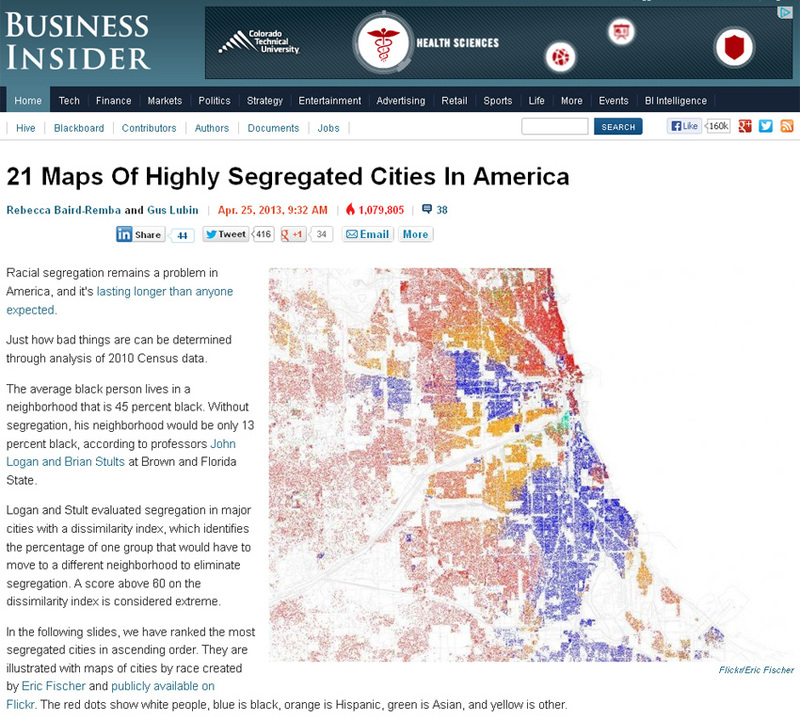 The New York Times has created an interactive map that maps segregation patterns in major cities, such as Chicago. Local activists should learn to use these and other data maps, in stories that draw more people into engagements that solve the problems shown on the maps. Concentrations of White poverty in Chicago - almost none! This WBEZ article focuses on White poverty in Chicago. 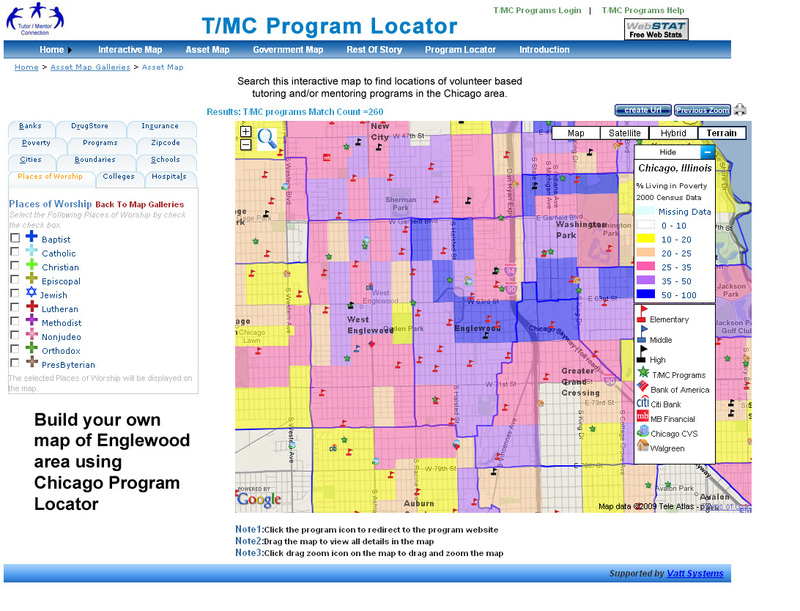 It's map shows only two census tracts, in the Rogers Park area on the North side, as being "high poverty". Read the article. 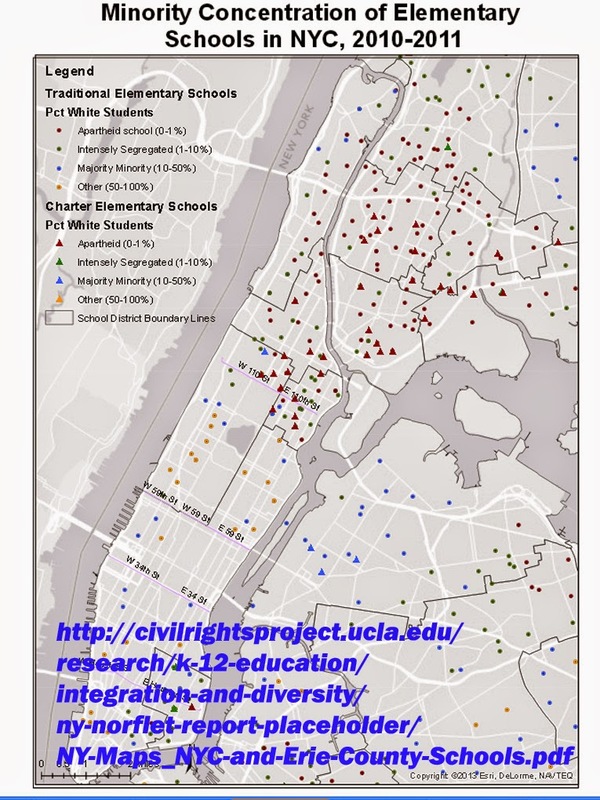 Update: 11/21/2017 - Here's 2017 Brookings.edu article about segregation, titled "60 years after Brown vs Board of Education, how racially balanced are America's public schools?" Look at the interactive map to see racial mix for more than 86,000 public schools. Update: 1/9/2018 -Here's article about school segregation in US cities. Title is We can draw school zones to make classrooms less segregated. This is how well your district does. 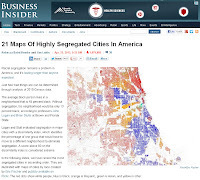 Is your district drawing borders to reduce or perpetuate racial segregation? 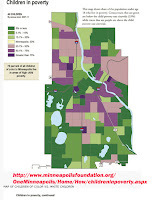 I included this map of Minneapolis in a 2014 article on the Tutor/Mentor Blog. Today I read a Brookings.edu article, titled The Changing Face of the Heartland: Preparing America’s Diverse Workforce for Tomorrow. It's a long article, but full of maps and charts and ideas that a relevant in Chicago and every other urban area of the country. This article not only focuses on the economic need to find ways to parepar minorities for greater roles in the workforce, but talks about the type of long term philanthropic support needed to achieve desired outcomes. One quote from the article says "We’re not talking about a pilot program or a two-year effort. … We’re talking about a 5–10 year commitment, and [dollar] numbers much bigger than what you might have had in mind. … "
We need this type of discussion, with the same use of maps, in every city. If you can point to a site where a similar article focuses on Chicago, please share it. If you don't have the Brookings.edu daily bulletin sent to you, I encourage you to subscribe. Some of the best writing on opportunity and equality that I've found.